Today, I’m thrilled to have Austin Brawner back on the show. I met Austin at the Ecommerce Fuel conference 3 years ago and we’ve kept in touch since. In fact, I had Austin on back in episode 65 a long time ago. Austin runs the Ecommerce Influence Podcast and also helps ecommerce companies grow with his site Brand Growth Experts. He’s also the CMO of an ecommerce company called Boom Boom Energy. Austin is a popular speaker on marketing for ecommerce and helped scale a company from 0 – 11 million in 2.5 years with email marketing. Anyway, Austin has a unique perspective because he works with companies so deeply to improve their business and today we’re going to pick his brain. Today I’m thrilled to have Austin Brawner back on the show, and he was a guest way back in episode 65. Recently Austin took over as CMO of a company called Boom Boom, and today’s podcast will analyze Austin’s exact thought processes as he restructures the sales funnels of his company, it’s going to be awesome. But before we begin I want to give a quick shout out to Klaviyo who is a sponsor of the show. Now I’m always excited to talk about Klaviyo because they are the email marketing platform that I personally use for my ecommerce store, and I depend on Klaviyo for over 20% of my revenues. Now you’re probably wondering why Klaviyo and not a different provider. Well Klaviyo is the only email platform out there that is specifically built for ecommerce stores, and here’s why it’s so powerful. Klaviyo can track every single customer who has shopped in your store and exactly what they purchased which allows you to do many things. So let’s say I want to send an email to everyone who purchased a red handkerchief in the last week, boom. Let’s say I want to set up a special autoresponder sequence to my customers depending on what they purchased, that’s a piece of cake, and there is full revenue tracking on every single email. I also want to give a shout out to my other sponsor Seller Labs, and specifically I want to talk about their brand new tool Ignite which helps sellers manage their Amazon sponsored ads. Right now I’m using this tool to manage my Amazon sponsored ad campaigns, and it makes things a heck of a lot more convenient. So number one I’ve always found it a major pain to generate my PPC reports on Amazon, cut and paste the data over to an excel spreadsheet and then use pivot tables before I’m able do any analysis. Well Ignite pulls all that info for you automatically and allows you to easily see what keywords are working and what are not immediately, there is no need to manually create reports or play with excel. So let’s say one of my hankie keywords is bleeding money, well Ignite will alert me of that fact, and I can reduce the bid immediately. So bottom line Ignite makes managing Amazon’s sponsored ads so much easier and the fact that they provide me with alerts means that I no longer have to monitor my campaigns like a hawk. If there are keywords that are doing well, Ignite tells me to add them to my exact match campaigns, if my keywords are losing money, well Ignite tells me to either remove the keyword or to reduce the bid. So head on over to sellerlabs.com/steve where you’ll actually find awesome tutorials on how to run Amazon PPC ads and the opportunity to try Ignite for 30 days for free. Once again that’s sellerlabs.com/steve. Now on the show. 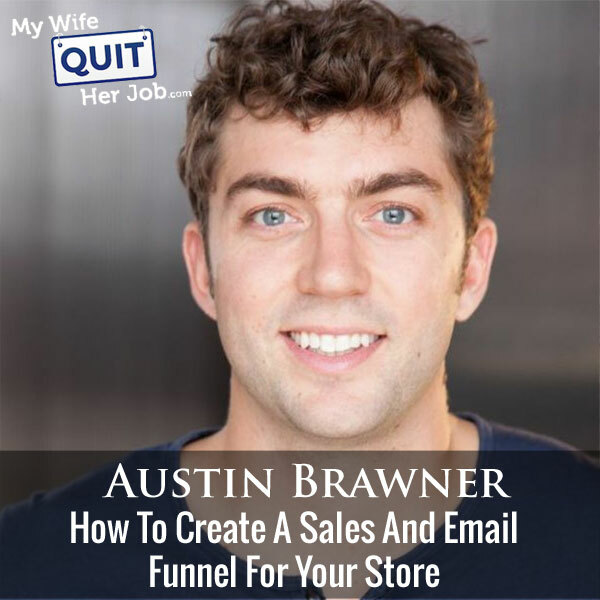 Steve: Welcome to the My Wife Quit Her Job Podcast, today I’m thrilled to have Austin Brawner back on the show. Now I met Austin at the Ecommerce Fuel conference I want to say about three years ago and we’ve kept in touch in touch ever since, and in fact I had Austin on the podcast back in episode 65 a long time ago. Now Austin runs the Ecommerce Influence Podcast and also helps ecommerce companies grow with his site Brand Growth Experts. He is also the CMO of an ecommerce company called Boom Boom Energy. Prior to getting married last year – congrats by the way Austin, Austin was a popular speaker on marketing for ecommerce and helps scale a company from zero to 11 million dollars in 2.5 years with email marketing. Anyway Austin has a unique perspective because he works with companies so deeply to improve them and today we’re going to pick his brain. And with that welcome to the show Austin, how are you doing today man? Austin: Hey good Steve, thanks for having me back, I’m excited to be here and to talk again about ecommerce. Steve: By the way I didn’t mean to imply that like all your speaking went downhill after marriage, I’m sure you know that. Austin: It’s like he got married, he’s done. Steve: Now he’s in Thailand, he’s just living on the beach. Yeah so for the listeners who don’t know or remember you, give us a quick background how you got in ecommerce and actually how you ended up being the CMO of Boom Boom Energy. Austin: Sure, so it has been a while I think since we chatted last time. I first got involved in ecommerce I guess it’s about four years ago or something like that. I was really interested — I was working in this company in Los Angeles, it was a startup, a healthy vending start up, and I watched how we basically grew the business from when I got there, we were doing like maybe 200 grand in sales to 11 million dollars in about two and a half years and we did it through email marketing and really building these automated sequences around our sales team to grow the business with an influx of email leads. I saw this and we built these really sophisticated email sequences targeting people based on their behavior, and I had a bunch of friends who were in ecommerce and I saw that what we were doing was not being done in ecommerce. So I first started working with a couple of different companies, brought over some of these email sequences that I was using, rebuilt them for ecommerce. I had a lot of success driving sales, really kind of fell in love with ecommerce here and best marketing, started the Ecommerce Influence Podcast where I interview experts and business owners who have grown ecommerce businesses typically from like a million dollars to ten million dollars plus, and have been involved with this growing ecommerce businesses for the last four years. I took over as the CMO of Boom Boom Energy about two months ago and have been kind of rebuilding what they’re doing and building it into more of like a structured tracking data jam company. Steve: Okay since we’re going to be talking about Boom Boom Energy today just give us like a quick five sentence overview of what the company sells. Austin: We sell the world’s best energizing nasal inhaler. What that means is that it’s a small inhaler that you basically breath and it’s all natural essential oils, so invigorates, energizes you, you don’t actually smell [ph] anything, you’re breathing in a scent that kind of clears your head, enhances your breathing, provides you a kind of a blast of intense reflection, we say it’s like gum for your nose. Austin: Steve said it was sketchy, so I said I’m coming to convert him which is basically that’s a big issue that we actually have with the product because it’s a product where people kind of need to be able to experience it. The first time you like breath in the scent you understand immediately why it’s important and why people like it. We convert fans really, really well at conferences or now we’re working on getting that messaging online. Steve: Does that mean that you guys are doing a lot of free giveaways of your product? Austin: Exactly, we actually are, we’re working right now on a free plus shipping offer. Steve: Okay yeah, let’s talk about that real quick. Austin: So that’s something that we’ve been experimenting with over the last I guess let’s see the last month really is when we realized that we had to get this product in people’s hands. And so we started on Facebook and we had a lot of success with kind of like a rap video, we talk about Boom Boom that became relatively viral, meaning a lot of people are sharing it, it’s got like 1.7 million views at this point. Steve: Wow, okay. What does a rap video have to do with Boom Boom Energy? Austin: It tells the story about Boom Boom like what it is. It shows people using it; it shows people getting energized and kind of explains the product. We realized it’s a top of the funnel thing, like people have to have a little bit of an understanding what the product is. So we got that video, we tried a couple of things and we started promoting it, people started sharing it and we got all these views for it. Steve: So is this like a high production quality video? Austin: Yeah it is, it is. It’s in the same kind of – we looked at some of the videos that have done very well on Facebook in the past, dollarship club was one of them, beard – what’s the guy’s name, the beard guy? Steve: Steve Brand, oh beard guy yeah right. Austin: I can’t remember the name like beard club or something like that, and we looked at those and we created one that was similar, obviously we’re like it’s still a bootstrapped startup so a much smaller production value, but still it’s giving us really good results. Steve: How much were you paying per click? Austin: Paying per click per view? Steve: Oh yeah actually per view and then I assume a portion of those people actually click through, right? Austin: Yeah a portion of them click through but our focus has been to try to get people to watch the whole video. Looking at numbers in the last month, we’re getting like 0.002 cent views and then we’re able to get people to really be able to view 95% of the video for about 3 cents. Steve: Okay, wow that’s really good and so then you’re retargeting these people, right? Austin: Yeah then we’re retargeting these people, so and when I say that we’re able to get them for 3 cents we basically were – if I take the amount of money that this video is generating and I look through the amount of money it’s generating it’s attractive enough. We spent and looked at the number of people that were viewing 95% of the videos; we’re paying basically 3 cents for people to view the video which is really good. Steve: So let me ask you this, the video probably doesn’t generate sales on its own, does it? Austin: It doesn’t, not really, it does some but not that many, the focus for us is to open the top of the funnel. So we want to get as many people viewing this video and then we take a look at the people that have viewed the full video or 75% or 95% of the video and then retarget people based off of that. It drives people to our site as well. So we have basically these campaigns, these free plus shipping campaigns that we’re running to people who have viewed a large like 95% of the video and that converts really well, we get basically like between four and five dollar CPAs on this free plus shipping offer. Steve: Can we talk about the offer itself, so what are you giving away and how much are you charging for shipping? Steve: So they’re paying 4.95 and you’re paying around $3 or $4 to acquire the customer? Austin: 6.95 for shipping, we pay between $4 and $5 to acquire the customer on some of our best campaigns, so we’re basically like — at this point we found that we can basically set these things up where we’re just paying – and also that the product costs us 6.95. So we’re basically losing like $4 to $5 to acquire a customer but that has been at this point kind of like our goal is to figure out how we could get to a point where we could acquire a customer for between like $4 and $6 because where we’re starting to work on is the backend with the up-sells, because that’s where we’ve realized if we have opportunity for the product like it’s good for us to go out and give away a bunch of products and we go do that at festivals where we’re happily giving away inhalers to people and we just want to be able to do it online. So we basically this is the way of $4 to $5 loss and then right now we’re kind of dialing in our up-sells. Again we’ve been doing this for two months, so we’re still at kind of like the testing stage right now, but the products that we’re using; we’re actually using Ezra’s Zipify pages. So I drive people from a Facebook retargeting ad to a Zipify sales page and that kind of talks about the product, they learn about it, then they click add to cart. It takes them to the product page where we have a free plus shipping offer where I basically take in the product and set it up using shipping weights so that the free version they just add to cart and it’s zero dollars, they’re going to pay 6.95 in the US. Then on the back end we’re using one click up-sell Ezra. Austin: Ezra as well and we’ve been dialing a couple of offers up-selling. We’ve been testing basically up-selling people in with 30 pack which is a much larger, it’s like an $80 purchase and then also testing a festival pack which is a bunch of [inaudible 00:14:03] lanyards and hats and like a larger group of these products and having some success with that right now. It’s still early in the testing stage for this. Steve: Okay can I ask you a quick question before you go on, like how did you determine that you want to pay $4 to $6 to acquire a customer? Austin: Good question, so we looked at the potential up-sells that we had as a business and we broke down an up-sell tree and said, well if we can get between like a 7 and 10% take rate on an up-sell at $80, we’ll be able to – and maybe like a 2% or 1% take rate on a down sell, we should be able to have an acceptable CPA of around $6, and when I say acceptable CPA meaning that we’re going to be able to buy traffic, buy customers at 100% break if our up-sell is taken at that rate and the down sells taken with that rate. So we looked at it and like well if we could hit this level the CPA we can dial in up-sells and our down sells we should be able to buy traffic at completely break even. Steve: Okay and then you know that once you have the customer since this is kind of like a consumable product, right? Austin: It is, it’s typically like use for 30 days, and so we know that there is a lot of people that will come back and make a second purchase. Like for us right now there is a big distribution side of the business and like it’s partly online to try to exposure people to the product online, but for us like getting critical mass and helping in that, it’s kind of like a red bull or like fiber energy [ph] where people look at fiber energy. It’s hard for us to think back what fiber energy looked at when it first came out, but there is almost a critical mass where enough people know what it’s all about that they’ll buy it from like a [inaudible 00:16:04] counter top, that’s our goal. So getting these new people to try it, convert it over into fans and customers. So if we can buy traffic at break even and then we know that once people are fans of it they’re going to come back and they’ll purchase from us over and over again. Steve: I see so the idea is just to get it break even and then you can scale it until it has the mind share and then people will just start buying this stuff on their own? Austin: Yeah people start buying this stuff on their own, people will come back and buy triple pack, a lot of the times people will buy them either for festivals, during December time or they’ll buy them for working and they liked having Boom Boom around. So that’s our goal with the free plus shipping offer. It’s been kind of a little bit of a long route to getting there because showing up when I first started working with them I came in I was like, okay well let’s go step by step and look at the different factors. You asked about how we figured out the acceptable CPA level for us? Austin: When I first started working with them Google analytics wasn’t even set up. Steve: How did you know it wasn’t tracking properly? Steve: Oh it wasn’t tracking, okay never mind okay. Austin: It wasn’t tracking; there was something wrong with the cart that was installed. So I started going through, did an audit, from there set up online goals that have been enhancing ecommerce tracking and started dialing in. That was the first step to making sure that we understood a lot more about the business, set up something called campus which is kind of interesting, not totally sold on yet but do you use campus by the way? Steve: No I don’t, you wanted to talk about it real quick or no? Austin: It’s like – yeah I’ll talk about it because it’s kind of interesting, it’s like an ecommerce dashboard where they help you calculate CPAs from different channels, you can put in your marketing spend for different channels and then it will calculate using Google analytics what your CPA for each channel is which can be helpful. It takes some time to get set up and it’s not a perfect solution, but if you’re struggling with something like that I’d recommend setting up campus. Steve: Are you talking about like your CPA across all of your Facebook campaigns because you have your top funnel and then you have your free plus shipping offer, are you talking about calculating the CPA as a whole? Austin: As a whole yeah, yeah, yeah, so like you can put your email spend and then it’ll track all your purchase that come in through email and give you a CPA of your email channel. Steve: Okay yeah I was going to ask you that question next actually because you have all these Facebook ad campaigns and you also have a backend email and it’s sometimes hard to calculate your CPA, I mean with all that stuff going on? Austin: Yeah it is, it is difficult, I think like – and that’s some of the stuff we’re going through as we’re transitioning and trying to move towards a more I can mention like data driven business. It’s how to calculate — our goal – it’s definitely not perfect, there are some sort of like our goal is to drive people through Facebook, capture emails and make sales. We also have a lot of people that come through with okay we capture their email through our free plus shipping like exit overlay and then they’ll got through the email sequence and purchase from there. So it’s definitely like a branded version. Steve: Like my version, we’re doing a free plus shipping offer right now too and we actually collect the email on the add to cart. So they go to landing page and you have to have an email address and then the action button is actually add to cart and then actually adds them to the cart, and then I had this whole funnel for that and then I have the up-sell and the down sell. I’m curious what your – so your up-sell is you’re selling a 30 pack? Austin: Selling a 30 pack yeah. Steve: Is that after they’ve entered in their information for check out or is it before? Austin: So with one click up-sell it’s completely afterwards. Austin: They’ve completed the transaction, they press purchase, and then a page pops up. All they do is they press purchase and it charges their card again, they don’t want to put any more information in and that is one nice thing about the one click up-sell is they just press the button and it’s charged separately through Strike like purchasing together in Shopify and pairs it for the customer. That’s one of the big things; I was looking a lot on all these different free plus shipping opportunities like those. If you look at ClickFunnels – what are you using for your free plus shipping? Steve: I just code everything myself, I have my home grown cart, so I have freedom to do whatever actually. Right now I‘ve chosen to just do the up-sell immediately after they’ve added to the cart, I’ll show them something that’s very similar to what they bought and offer them like an insane discount of like between 30 and 40%. Austin: Okay yeah exactly so you’ve got it afterwards. If you’re not coding yourself there is a couple of different options out there for you if you want to create an up-sell. There is ClickFunnels, there is CartHook, there is one click up-sell, and looking at the different options the reason why I like one click up-sell is that it does pair the carts. If you’re using ClickFunnels you’re not going to have combined customer records, it’s going to be done with the ClickFunnel’s cart, and it’s kind of messy. So that’s why one click up-sell works for us, it’s like even though it’s checking out with Stripe and we’re paying a little bit on each one of those things, it pairs in the Shopify back end and so we’ve got the actual information of the customer. Steve: Yeah it makes sense otherwise you’re trying to combine two different carts, right? Austin: Yeah it’s annoying exactly. Steve: Yeah okay, what does your down sell look like? Austin: So the down sell is our festival pack, so our down sell is 50% off a $59 pack that gives people a hat, a lanyard and a couple more boom booms, and again like right now we’re just purely like a point where we’re just driving people through this thing and like it’s too early to tell if it’s even going to be successful. I think what’s important for people who are listening is the thought process behind it and if you want to experiment with something like this in the end, we just realized like our goals are a little bit different than maybe some other businesses. We just try to get as people into try it as possible and figure out a way to make something super appealing so we can acquire these customers and that’s working. Acquiring the customer is working whether or not we’re going to be able to dial it in to make it so that it’s at break even, that’s still to be determined at this point. Steve: Sure, sure, how did you determine the price of your up-sell, like what criteria did you use? Austin: Well we try to give [crosstalk 00:23:47]. Steve: It’s pretty expensive, right? Austin: Yeah so I actually looked at it from – I was talking to Richard from the Funnel Engine who’s been doing some of this type of stuff and we kind of were chatting about different price points, and basically $70 was kind of a range like $70 in profit was kind of arrange in what we thought we would be able to hit if 10% of the people were going to take this thing. I came up with this I’m doing reaching out to other people who were already in free shipping offers and seeing what their up-sell take was. So I was like, okay if we can get it dialed in at like between 7 and 10%, then the only way it’s going to be able work on Facebook is if we can have a price point at this point because it can be quite expensive to acquire customers. Steve: Yeah okay, so it’s just mathematically driven based on a few assumptions of your conversion rate and how much it’s costing you essentially? Austin: Exactly and it’s not – that’s like the keyword like you can’t – I feel like if it’s not going to work for us, it’s not going to work, it’s more an experiment that if it does work out we have a goal to get, if it doesn’t then we’re going to trust the video. Okay so you got that going, what other changes have you made since you joined? Austin: So I’ve been focusing on email marketing because when I work with businesses almost 100% of the time they are under optimized on email and they’re not driving enough sales really on the life cycle of the customer. So I’ve been going in and setting up funnels like follow up funnels for people who come through the free plus shipping offer when they sign up. They then will receive emails following up and reminding them about making this purchase. Steve: How big is that funnel actually, the free plus shipping funnel like how many emails is it and what does the general flow look like? Austin: So the general flow is six emails I believe, and the flow is reminding people initially about the free plus shipping offer because they sign up but they don’t take it, then my only goal is to get them to take that offer. So initially the first email is just driving them to the offer page. The second email is communicating what the product is all about and that’s a big issue for us because people think about snipping something and it’s a big thing when I convey to people, it’s like if you’ve ever smelled menthol you understand, you probably have an idea what the product is like, but it’s communicating this all natural, sharing the brand story, the social proof, so the following email is social proof related. So we’re going to be sharing with people reviews, other people that have been using the product again to establish credibility, following up with the free plus shipping offer after that and then changing over to like a 10, 20% off offer that escalates from 10 to 20% off in the following two emails. So I call it bio dice sequence and I talked about this a lot on my podcast on different webinars that I’ve been hosting. This works with pretty much any business. People come in, you give them whatever – they sign up through an email pop up; you initially give them their offer right away, so whatever you use, whether it is free shipping 10% off, whatever. You give that offer to them immediately, then you start hitting people with your brand story, with reviews to your product. You figure out when they’re most likely to purchase, so if they don’t purchase right away like in how many days are they typically going to purchase. If that’s two days then you don’t give away any discounts until two days. After that then you start targeting people with a discount letter, something that incentivizes the people who’ve passed the threshold when they are typically in the purchase. You incentivize them and help them make a decision and try to grease the wheels to make them become a customer, help them become a customer. Steve: And what do you do with these subs if they don’t end up buying after the entire sequence is over? Austin: They’re just tossed into the newsletter sequence and then they’ll receive a campaign from us once a week. Austin: But that doesn’t happen until they pass through the sequence. Austin: And then if they churn like I’m always – I clean the list as well, it will be like three to six months just for people who don’t open up emails. Steve: I’m just curious; do you get a lot of people complaining about the shipping cost? Austin: Help with free plus shipping? Austin: We do get some but it’s a pretty like solid free plus shipping offer like typically they look at it from 16.95 plus 4.95, it’s over $20 and they’re 6.95, so the value is there and a lot of people will ask us for free products just on Facebook, I’m sure you get the same thing. Austin: People will be like, oh give us your product. Steve: I was just curious if you had the same experience we were but yeah, yeah. Austin: We do get people but it’s like I don’t know it’s like you’re not going to get – we can’t give it away really for free. Steve: Okay because I might be wanting your testimonials on your second email or whatever, Steve Chou of My Wife Quit Her Job. Austin: Exactly Steve Chou thought it was sketchy, now he uses it ten times a day. Steve: Okay so we got that bio die campaign, what other areas of the life cycle do you kind of track? Austin: So from there the next step in what I look for, for Boom Boom and also for any other companies and I have worked with a ton of large ecommerce companies and we always focused next on what to do after someone makes a purchase. So you’re going to have a post purchase sequence. How I typically target a post purchase sequence is in best actions for people, what would you like your customers to do? If you would like them to write a review, if you would like them to post a picture on Instagram, if you would like them to refer a friend, whatever type of best actions you want to put in to your post purchase sequence. Also like you want to thank them for making your purchase, whatever you want to do, you put that in your post purchase sequence over a period of maybe like 14 days depending on your product again like it’s all dependent on what – if you’re selling refrigerators it’s going to be quite a bit different than selling energizing nasal inhalers that are consumables. Then I look at and try to figure out when people typically make a repeat purchase, and depending on your products it is going to be different. So if for your products it’s 45 days or 42 days, then what I like to do is let people go to that point, so the average person is going to make a purchase, let them get to that point and then start – because you want them to be able to make as many full price purchases as possible. At that point you’re going to focus on incentivizing them to make their next purchase, so that’s where the discount letter could come in where you’re going to be hitting people up with offers and trying to incentivize them to make that second purchase because that’s where your profit is going to come from. I think a lot of times people underestimate [inaudible 00:33:02] and the effect that [inaudible 00:33:04] have on their business. One of it is I was talking about email marketing is because it’s very toll limited. If you’re going to be reacquiring a customer off of Facebook, maybe they purchased from you already and you pay $15 or something to acquire them for the first time. If you’re going and you’re reacquiring them on Facebook for another $15, your profit margin is very slim on that customer. If you’re able to get them and reacquire them through email, your profit margin is very, very high on that person because you’re just paying a fixed cost, you’re paying Klaviyo or whatever or MailChimp, you’re paying a fixed cost and it’s much better for you. That’s the focus is to try to reacquire them with incentives when they pass that level of repurchase. Steve: During this win back campaign are you running concurrent ads on like Facebook and Google display to get them back as well? Austin: Yes, so one of the nice things about Klaviyo and what they’ve done recently in the last like six months is they started up so you create the customer audiences based on segments that you create within Klaviyo. So Klaviyo if you have customers who come in, it’ll track all their behavior on your website, so if somebody makes a purchase, you can then create a segment of people who have made one purchase and have not purchased again let’s say if the sequence is going in 45 days. So at that point when people make a purchase and don’t repurchase in 45 days they’ll be added to a little segment of people and you could sync that to Facebook. So you could have that created customer audience and then when people are added into that customer audience they will then be targeted with whatever ad that you’re running if you want to retarget them using that audience. So you can have emails going out, at the same time stack that with retargeting ads on Facebook using the Klaviyo and Facebook integration. Austin: That also works if you’re going to be passing people through like at 45 days you may have a customer audience at a certain amount and then 60 days it may switch to a different offer, and you can set it so that the audience automatically adjusts and they’ll be now triggered on a different email. Steve: Klaviyo is going to be sponsor of this podcast I think by the time this episode comes out. Steve: Yeah this is really powerful and all these audiences are dynamic meaning Klaviyo syncs all the different audiences in real time, so they’re always up-to-date which is pretty cool. Austin: It’s really cool; I mean it’s a game changer, so they came out. Steve: Okay so we got the win backs, anything else? Austin: The other campaign that I focus on is a VIP campaign. This one when you’re looking at the people who really drive your business, most businesses are going to be at some variable of like the 80/20 rule where 20% of the customers are going to drive 80% of the sales. I’ve looked at maybe 60 different ecommerce companies; I would say ecommerce in general it’s more like 20% driving between 65 and like 70, 75% is typically what I see. That means there is a very small limited group of customers who are driving a vast majority of sales and are ultra responsive to your marketing. So what I do is I focus down on about the top 10, 5 to 10% of the customers and I set up a campaign I call it the ‘ask and receive campaign.’ So I’ll set it up in Klaviyo where I look at my customers and say, when people hit $200 in revenue and have purchased three times they are automatically added to my top 5% because that’s where they qualified. So I set up a segment in there and the moment people hit that it’ll start triggering a campaign that follows up with them and usually about 15 to 20 days later it says, talks about why they’re valuable, how I appreciate them being with us and I’ll give them some sort of a discount on the next purchase. That goes like crazy; I actually got one campaign that’s running with a 97% open rate on this email. Austin: Because it’s targeted to ultra highly responsive people who have all the VIPs. So that drives them, they take this coupon; they make another purchase that’s very successful. Steve: Let me ask you this question, when those people have purchased like could you have gone away with knocking them a coupon and they probably would have purchased anyways? Austin: It’s possible, we can give them like not give away a coupon, give that a try, you could just follow up with an email with these people and thank them, they may purchase again. Typically what I do is I’ll send them like a thank you, also like one of the things with this company that I was talking about its 97% open rates, we don’t really discount at all. So it’s like it’s the only thing that we give them and it’s more framed as like a thank you for being a great customer for all these years and so that’s the framing of it. We also follow up with a survey that comes out — that goes to them basically 10, 15 days later that asks them for their feedback. It’s like a 25 question survey, it takes about five to ten minutes to fill out for these people, but our goal is to get the information from these top customers. We want to know when they found us, what they’re looking for; it’s like a unique insight into our well of customers. Austin: About 25% of people filled that out for us and it also drive some sales as well. Steve: So do you then change the copy on your landing page according to the survey answers? Austin: So we actually – it determines a lot, it determines like what products we bring out, a lot of the questions are related to products. So we found out that this particular company that I was working with — we try to figure out what products to bring out next and like 80% of our VIP customers said the thing that they were most excited about was more t-shirt designs which kind wasn’t on the radar. So that immediately switched to be in kind of top of the list which is everyone wants more t-shirt designs, and these are the people that are spending a vast majority of the – driving the vast majority of our sales, let’s give them more t-shirt designs. Steve: Okay this is what the previous company you consulted with, right? Austin: Yes this is not with Boom Boom. Steve: Okay interesting, and so you do that primarily for information gathering not necessarily to extract maximum profit it sounds like? Austin: Yeah this one is mostly for information gathering, it’s like trying to have a conversation with your best customers, they’ll give you email and information, see if you want to follow up and talk to them. The same thing happen like you’ll notice with Bonobos, Bonobos if you go to any guide shop, any guide shop they’re filled with suits. If go to Bonobos.com, one of the things they’re showing everywhere is suits. The reason is because they did some customer research and found out that their well of customers, the people who were spending the vast majority of their – driving the vast majority of their sales were buying suits. So even though it’s a small percentage of their actual purchases, it’s the vast majority of their revenue. So they realized that from having conversations with their customers, learning what they’re purchasing and they redesigned their landing pages, redesigned their guide shops to focus on the high ticket items the suits that were driving the vast majority of their profit. Steve: So let me ask you this, when you’re creating look alike audiences for your customers, do you do the look alikes for the wells [ph] or do you do look alikes for your general customers, like how do you generate your look alikes? Austin: A big chunk for look alikes. In an ideal world yeah you take your look alikes from your best customer, you take your best customers, and you make look alikes based off of them. So let’s put it this way like if you could go – you figure out what your, the minimum number of the higher percentage customers you have that you could turn into a look alike campaign, export that and make that a look alike campaign. So don’t use the entire audience, use the better part of the audience if that makes sense. Steve: Yeah so for our store we’re using like repeat customers since most people just buy once for the wedding and then don’t come back unless they get divorced which hopefully doesn’t happen. But there are a subset of people who are actually higher in age that come back for more, so that’s kind of why I asked the question just to see how you guys are doing it. Austin: Yeah it’s definitely focusing on those the better customers. Steve: Okay and then are you doing all of this stuff for Boom Boom right now as well? Austin: So I’m doing this for Boom Boom right now, there is one of like looking at coming into a kind of a fresh business where the opportunity is. It was focusing on top of the funnel with Facebook and then also on the back end with retention campaigns, these ask and receive campaigns, post purchase, the bio dice, so building all those on Klaviyo has been kind of my first step. I’ve been doing like this consulting for the last couple of years, I had even a marketing agency working with some of the largest ecommerce brands out there. So I’ve been taking that and bringing it to Boom Boom and then I’m also working with – Drew Sanocki and I are also working on kind of a two day intensive where we build all the stuff out for different brands. Steve: Let’s give Drew a quick plug here nerdmarketing.com if you guys want to check it out. So Austin that’s great, I mean we’ve been chatting for quite a while now and you gave a lot of great nuggets, and thank you so much for giving an insight to actually how you approach like a brand new company and kind of dissect the different strategies and what to tackle first. Austin: Yeah it’s been no problem in that it’s definitely a learning experience for everyone. I feel like when you come in you’re trying to find opportunities, you’re going to start with the foundation the basic analytics and then get those to set and kind of testing different things and see if you can find one that scales. Steve: Maybe we’ll have to do a little bit of follow-up to see how your campaigns are doing maybe like six months later and see where things are as well. Austin: Yeah that would be great, we’d love to. Steve: Cool, well in the meantime Austin tell the listeners where they can find you online if they have any questions. Austin: Yeah so the best place to find me would be to go to brandgrowthexperts.com, that’s where Drew Sanocki and I my business partner have our website, we talk a little bit about how to send smart and more profitable emails, and we’re actually hosting an event in March after Traffic and Conversion Summit March 13th to 14th where we’re going to be helping about 15 different businesses, brand owners build out these campaigns. So if you’re interested go to brandgrowthexperts.com and you can learn some more about that and what that looks like. Steve: Cool, well hey Austin thanks a lot for coming on the show man, really appreciated. Austin: Hey Steve, thanks a lot, I really appreciate your checking with me every time and yeah I’ll talk to you soon then. Steve: Hope you enjoyed that episode. What I love about Austin is that he knows what he’s doing and he has this track record of working with companies and blowing up their sales. For more information about this episode, go to mywifequitherjob.com/episode165. I also want to thank Klaviyo which is my email marketing platform of choice for ecommerce merchants. You can easily put together automated flows like an abandoned cart sequence, a post purchase flow and a win back campaign, and basically all of these sequences that will make you money on auto pilot. So head on over to mywifequitherjob.com/K-L-A-V-I-Y-O, once again that’s mywifequitherjob.com/ K-L-A-V-I-Y-O. I signed up for the BoomBoom newsletter to see if I could learn a thing or 2 from Andrew’s expertise. Got an email today that might be the biggest terms of service violation for requesting positive reviews I’ve ever seen and could easily get an account banned permanently.